Spray 6-quart Instant Pot™ insert with cooking spray. Cut 1 sheet of heavy-duty foil (12 inch square); spray with cooking spray. Place potatoes and 2 teaspoons of the garlic in insert; pour in water. In small bowl, stir bread crumbs and milk; let stand until milk is absorbed. In medium bowl, add beef, onion, remaining teaspoon of garlic, the Worcestershire sauce, egg, 1 teaspoon of the salt and the pepper; stir. Add bread crumb mixture; fold ingredients together. Taking care not to compress mixture, form small loaf, and place in center of foil square. Pull corners and sides of foil up, but do not seal. Place foil on top of potatoes in insert. Secure lid; set pressure valve to SEALING. Select MANUAL; cook on high pressure 30 minutes. Select CANCEL. Keep pressure valve in SEALING position to release pressure naturally for 10 minutes. Then set pressure valve to VENTING to manually release any remaining pressure. Carefully lift foil with meat loaf, and transfer to cutting board. Remove loaf from foil; discard foil with fat. In small bowl, mix ketchup and brown sugar; brush over top of meat loaf. Meanwhile, coarsely mash potatoes; stir in whipping cream, butter and remaining 1/2 teaspoon salt. 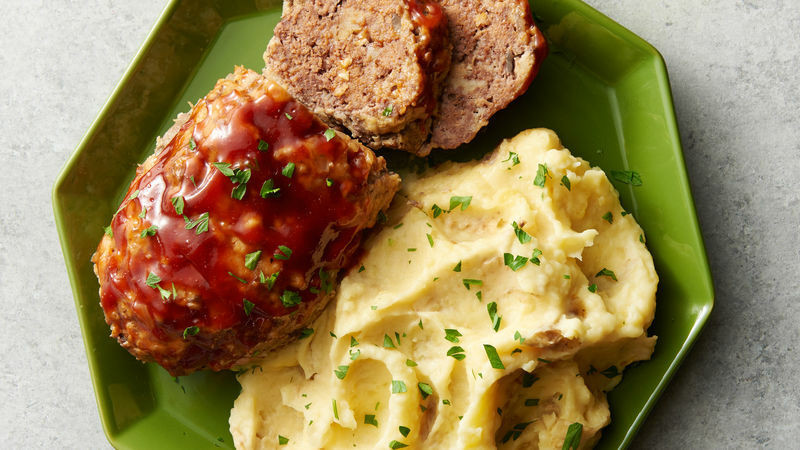 Slice meat loaf; sprinkle meat loaf and potatoes with parsley. We love using Yukon Gold potatoes, because you don’t need to peel them; however, peeled russet potatoes can be used instead. Using extra-lean beef minimizes the amount of leftover fat in the foil.